Why do I have to fill in my profile and curriculum? The more you tell us about yourself, the more useful Digitalis CPD becomes. For example, if you tell us that you are a GP, we will select journals to show you that are most relevant. We can even make it relevant to your location. An of course, your colleagues can find you more easily too! The curriculum is also important to fill in. While it helps us push you relevant content, it will also help you identify the spread of learning. How do I set-up my profile? After registering for the first time use the side slide-in menu and navigate to ‘Settings’. Enter your profile so that your colleagues can easily find you and choose one or more curricula to work with. If your curriculum is not listed, select ‘not listed’ but also make sure you email us so we can make sure we make your curriculum available. 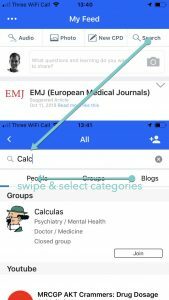 You can also select if you want reminders for adding logs and if you are allowed to use an impact factor in calculating your CPD points. Now you are ready to go! You can view a video about setting up curricula here. 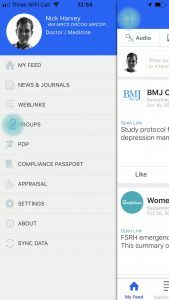 Download the Digitalis CPD app from Apple’s AppStore or Google Play. 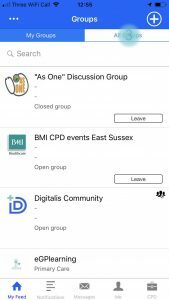 Open the Digitalis CPD app. If you have a LinkedIn or Facebook account, simply tap on the relevant link and, with your permission, you will be registered with the name and email from this account. If you would like to manually register, ‘Register’. Enter your name, email address and choose a password and tap ‘Register’. You will be sent an email to verify that you have entered a valid email address that you have access to. Click on the verification link and then go back to the app and log in with the credentials you chose. If the email doesn’t appear in your inbox, check your junk folder. Please email us if you can’t find it. We are aware of an issue in Android where sometimes users are not able to register. We are working on this. In the meantime, simply email us so we can set you up. How do I register a new account with Digitalis CPD? When you hit ‘Register’ after entering your credentials, an email is sent to the address you entered. Click the link in the email to verify your address and gain access. Sometimes this email disappears into a Junk folder. If you can’t find it, email us. An alternative may is to simply register through LinkedIn or Facebook by tapping the relevant box. Once you have done this, don’t forget to fill in your profile and curriculum. What to all of the buttons do in the bottom menu bar? The most important functions are accessible from the bottom menu bar. My Feed has a selection of updates from people and groups you are following, news, journal articles, jobs, courses and promotional material. ‘Notifications’ display things like connection requests, follows and group requests. From the notification screen, if you tap something you will be taken to the relevant screen. ‘Messages’ is an in-app messaging feature where you can send instant messages to connections. All conversations can be logged as CPD with the tap of a button. ‘Me’ will display your profile with all of your posts. You can access all of your groups, connections, follows and followers from here. ‘CPD’ displays all of the CPD logs you have made. You can sort them by date or alphabetically by title and search titles and keywords. Swiping any entry allows you to set a reminder regarding the entry, flag it to find it easily in future, share it into your feed or into a group or delete it. What can I access via the Side Menu? Reference – News, journals and a collection of useful web links. When reading an article, tapping the ‘add to CPD button will automatically pull this page into a new CPD note. Groups – Access or set-up closed discussion groups. Again, any posts can be quickly captured into a CPD log. PDP – You can create your Personal Development Plan here and link to it whenever you add a relevant CPD note. Compliance Passport – you can keep a record of compliance related documents here ready for sending out when required as one complete PDF. You will be alerted when something is about to expire. 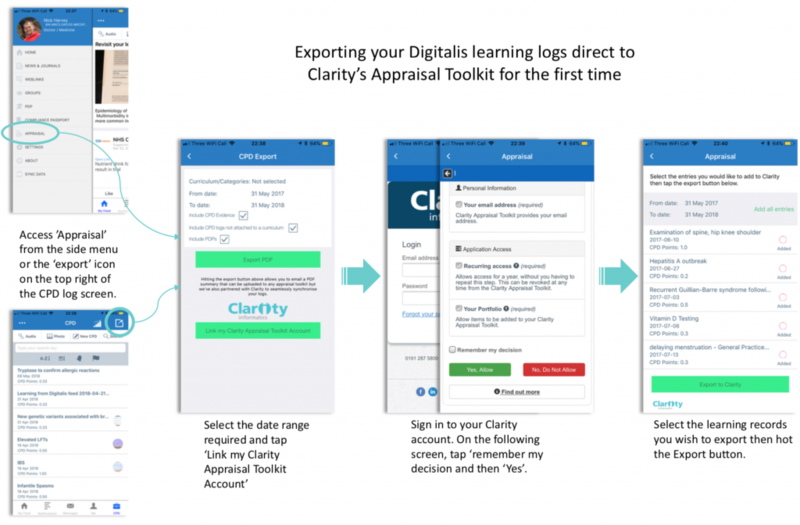 Appraisal – here you can export your CPD logs to a PDF or directly into Clarity’s Appraisal Toolkit. Don’t forget to select the date range and curriculum you wish to export. You will probably need to tick ‘include logs not attached to a curriculum’. Settings – change your profile an other settings such as curriculum here. Also Logout via this page. Sync Data – tapping this ensures all of the CPD logs on your smartphone are backed-up to the cloud and any logs entered on other devices are pushed to your current device. How do I start a group of my own? Tap the ‘add’ button in the top right hand corner. – Tap the profile image to add a group icon. – Add as many keywords as you like. Anything written in here will ensure your group appears when that search team is entered. – By default, groups are closed which means you as the administrator will have to accept everyone who requests to join. Tapping the ‘Open Group’ toggle will mean that anyone can join your group. 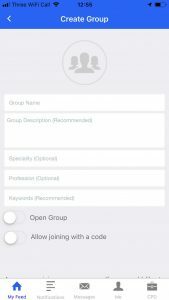 – If you decide to create a closed group, you can set up a joining code by hitting the next toggle button. You can then share that code with anyone you would like to join. Once you have created your group, it will appear in the ‘My Groups’ tab of the Groups page. When in the group you can then make posts, invite or approve requests to join and nominate other members to be an administrator for the group. How do I log out of the Digitalis Smartphone App? It is rare that you would need to log out of Digitalis and if you are going to, we advise you hit ‘Sync Data’ in the side menu, to ensure everything is backed up in the cloud. The log out button is located in the settings screen. The easiest way to find anything in Digitalis is to use the search function by tapping ‘Search’ in the top right of the home screen. You can narrow your search results down by selecting a category below the search bar. Tap the ‘All Groups’ tab. Scroll all groups or enter your search criteria. How do I export CPD logs into the Clarity Appraisal Toolkit? This is a simple process via the ‘Appraisal’ Link in the side menu or the ‘export’ icon on the top right of the screen when viewing your CPD logs. How do I add records to my private CPD log? From most pages in the app these three icons are always available to instantly add a CPD note, capture with the camera or record a memo. 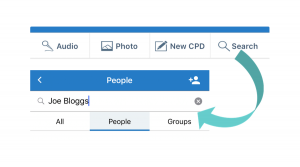 In pages where you are viewing information the note icon will automatically append that title and URL to the new CPD note. This likely relates to a bug in an older version of Digitalis on iOS. First of all, make sure all of your content within your app is synchronised with our servers by tapping ‘SYNC DATA’ at the bottom of the side menu. Second, log out of Digitalis by going to ‘SETTINGS’ in the side menu. Third, make sure you are running the most recent version of Digitalis in Apple’s AppStore and then log back in. This should fix the problem. If it doesn’t, delete the Digitalis app and re-install it. If you are still having problems, please let us know. Hitting this button enables you to search for people, groups and reference material that we curate for you. How do I set or cancel reminders? 1. Reminder to enter CPD logs. In settings a notification if CPD has not been entered for a week can be turned on or off. 2. Reminder regarding an individual CPD log. By swiping and tapping the reminder bell icon on any CPD item in MyCPD you can set reminders to appear after a given period. For example a reminder to repeat your CPR training or a refresher course etc. When one of these items is due there will be a number on the Digitalis App icon which will disappear once the reminder has been dealt with. How do I monitor the progress I am making with my CPD? When viewing the list of CPD logs, you can tap this icon on the top right to view your progress according to each curriculum. A YouTube video showing how you can do this can be accessed here. How do I export CPD logs and and Compliance Passport data? In both CPD and Compliance Passport screens, if you tap this ‘export’ icon you will be presented with some options regarding what to export. Here a PDF of evidence can be generated and emailed.